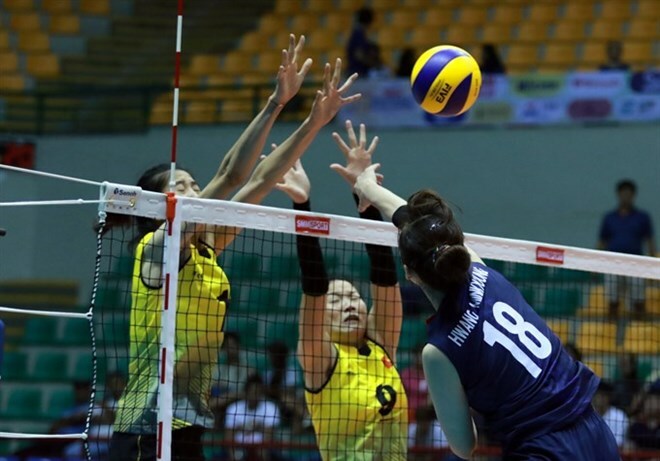 Hanoi (VNA) - Vietnam suffered their first defeat at the Asian Senior Women’s Volleyball Championship’s preliminary round, losing 23-25, 19-25, 25-17, 22-25 to the Republic of Korea in Pool C, in the Philippines on August 11. The loss however did not affect Vietnam’s berth in the next round as the team have already qualified after two wins in previous matches. With three wins, the RoK top the pool and Vietnam are second. Both teams will be in Pool E with Kazakhstan and the Philippines in the next round. In other matches, Iran finished the group stage on a winning note, beating the Maldives 25-4, 25-13, 25-14, Thailand easily trounced Chinese Taipei 26-24, 25-14, 25-15, while China overcame Australia 25-13, 25-8, 25-9.